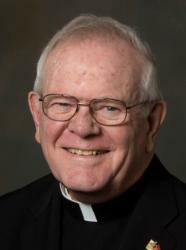 SYRACUSE, N.Y. (CNS) — Retired Bishop James M. Moynihan, who served as the ninth bishop of the Diocese of Syracuse from 1995 to 2009, died March 6. He was 84. The bishop’s body was to be received at the Cathedral of the Immaculate Conception in Syracuse the afternoon of March 9 for a viewing, followed by an evening vigil. His funeral Mass was to be celebrated March 10 by New York Cardinal Timothy M. Dolan, followed by burial in the cathedral crypt. A native of Rochester, Bishop Moynihan was ordained and installed as the bishop of Syracuse May 29, 1995. He retired April 21, 2009. “He faithfully served the people of God as a priest, pastor and in many leadership roles. We thank God for his service to the church,” it said. Bishop Moynihan’s 14 years as Syracuse’s bishop included shining moments and dark days, from spearheading some of the most successful fundraising campaigns in the diocese’s history and supporting the sainthood cause of a local Franciscan sister to implementing parish reconfigurations and addressing the clergy sexual abuse crisis. A staunch supporter of life at every stage, Bishop Moynihan spoke out often against abortion. Nearly seven months after his installation, he led a prayerful procession of more than 300 people to Planned Parenthood in Syracuse; he was the first Syracuse bishop to lead such a procession, according to a diocesan release. In 1999, he participated with nearly 30 others in a silent vigil on the steps of the Onondaga County Courthouse to protest the possible use of the death penalty in the sentencing of James “Jeff” Cahill. Bishop Moynihan oversaw the most successful fundraising campaign in the diocese’s history, raising more than $42 million through the Heritage Campaign. More than $52 million was generated over the 14 annual HOPE Appeals during his tenure. The Bishop’s Education Fund accrued $1.2 million by his retirement. Bishop Moynihan also helped to steward a bequest of more than $30 million from a Binghamton couple, Robert and Catherine McDevitt. His 2001 pastoral letter, “Equipping the Saints for the Work of Ministry,” outlined the “institutional and structural challenges” facing the diocese, including the shrinking number of priests and religious and the aging and declining local population, as well as responses to those challenges, including creation of pastoral care areas, parish mergers and closures, and increased lay responsibility. In 2007, Bishop Moynihan announced parish reconfiguration plans for the diocese that will ultimately lead to the closure of some 40 churches and the merging of others in the years to follow. This pastoral planning continues in the diocese today. Bishop Moynihan led the local church as the national clergy sexual abuse crisis shook the faithful and hit home. The diocese implemented the standards of the U.S. Conference of Catholic Bishops’ “Charter for the Protection of Children and Young People” and put in place a child and youth protection policy; mandatory abuse prevention training and background checks for all clergy, religious, employees, and volunteers who work directly with children; a victim assistance coordinator; a safe environment officer and committee; and a diocesan review board tasked with determining the credibility of allegations of abuse. In 2003, Bishop Moynihan held a healing service at St. Mary of the Assumption Church in Oswego, the first of several such services. In 2004, he issued a report on abuse by clergy in the diocese stating, among other statistics, that 16 diocesan priests had been permanently removed from ministry. Bishop Moynihan was a champion for St. Marianne Cope’s cause for sainthood. The Franciscan nun lived in and ministered throughout central New York before moving to Hawaii in 1883 to care for patients with Hansen’s disease, also known as leprosy. She died in 1918. Her remains were moved to Syracuse in 2005 as her cause for canonization unfolded. She was canonized in 2012. “Bishop Moynihan’s support to Mother Marianne’s cause is integral to her being [elevated] to the status of Blessed Marianne today,” the late Franciscan Sister Mary Laurence Hanley, advocate for the cause, told The Catholic Sun, Syracuse diocesan newspaper, in 2009. Long is editor of The Catholic Sun, newspaper of the Diocese of Rochester.